Dr. Sherrilene Classen, Prof and Chair of the OT Department and Director of the Institute of Mobility, Activity, and Participation (I-MAP) and Dr. Carl Crane, Director of the Center for Intelligent Machines and Robotics (CIMAR), have partnered to investigate the impact of autonomous vehicles on the driving behaviors of older adults. 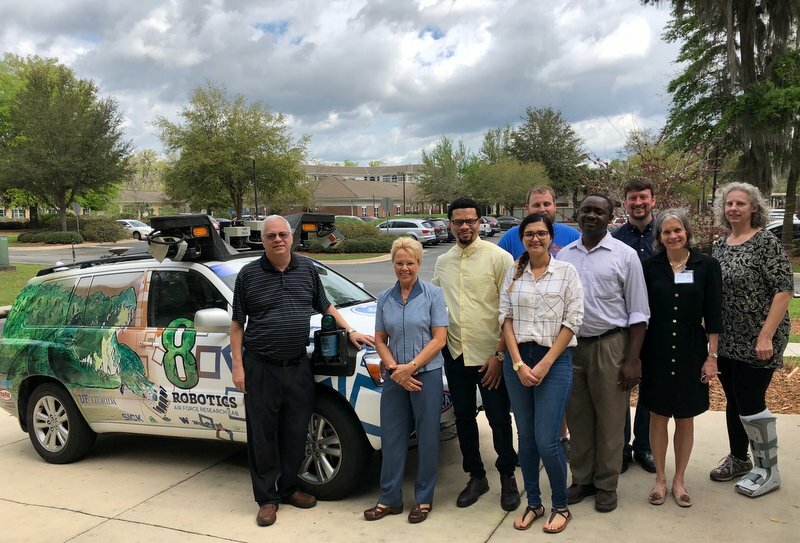 Recently the I-MAP team rode through the Oak Hammock retirement community in the University of Florida’s autonomous vehicle, the NaviGATOR. This self-driving vehicle uses GPS and multiple sensors, cameras, lidar and radar to navigate pre-determined routes. The I-MAP team is currently working on a project with the American Automotive Association to synthesize the literature and rate the importance, support, potential benefit and usability of vehicle automation technologies. Riding in the NaviGATOR provided the team with first-hand experience using vehicle technologies they are exploring in their research.